Today is a special day in my life. Today is the day I become the answer to life, the universe, and everything. Yes, today I am 42! And for me, 42 is a very, very special year. It is, as I said, the year I become the answer to life, the universe, and everything. It’s a powerful year. It’s a year that needs to be marked with greatness and achievement! But 42 needs more than a weekend away; it needs a full year! And I am planning to really make something of this year. I am going to work hard towards my running goals. I’m going to work hard towards my desire to take better care of my own needs. And I’m going to work like holy heck to get my PhD thesis submitted before the clock ticks over to 43. Of course, it would be silly to put too much pressure on myself just because I’m 42. After all, I have faced a lifetime of lessons that can be summarised as: Things will go completely haywire; there will be meltdowns and malfunctions; there will be demolitions and lost towels; there will be rubbish cups of tea and even more rubbish poetry; and there might even be an intergalactic war or two. Or to summarise the summary: Just because I’m the answer to life, the universe, and everything, doesn’t mean that life is going to be perfect this year. In fact, it probably won’t be a perfect year. Or to summarise the summary of the summary: Life is neither fair nor perfect. But it’s my year. It’s my chance to attempt to control my fate (yes, God, I hear you laughing). It’s my chance to try to find a bit of success in my little corner of the world. So, here’s to 42; here’s to being the answer to life, the universe, and everything! 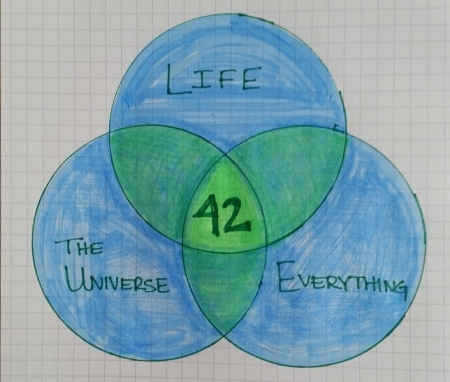 42 is the answer, but what’s the question? The closest that the computational matrix ever got was “what do you get if you multiply 6 by 9?”. Which I always took as a reason to adopt the view that numbers are never the answer to anything, especially how old a person might be. In the meantime, while you’re searching for your question, Happy Birthday Frances. I look forward to reading all about the next chapter in your adventure! Thanks, Ephemera! I’m sure I’ll spend the rest of my life finding the question ... but as long as I’m living a happy life, the search will be worth it!